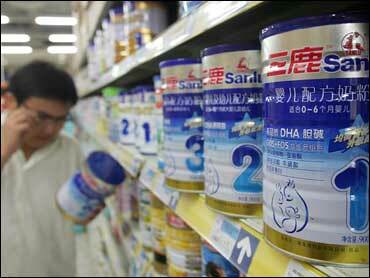 China Milk Tainted with Melamine Again - Are We at Risk? (CBS/AP) Milk it does a body good - unless it's the melamine-flavored kind from China. Last month, Chinese officials discovered 76 tons of milk powder and dairy products laced with deadly melamine - an industrial chemical unscrupulous milk processors were accused of adding to watered-down milk to make it appear rich in protein in quality tests. These quality tests measure nitrogen, which is found in both melamine and protein. But while protein builds strong bodies, melamine can give you kidney stones and kidney damage. It can also kill children. In 2008, melamine-tainted milk killed six babies and sickened 300,000 children. Dozens of people were arrested in the wake of the scandal, and two workers - a dairy farmer and a milk salesmen - were executed for producing and selling toxic milk. This most recent scandal appears to stem from milk products left over from 2008. The recently-seized dairy was probably produced in or before 2008 and stockpiled instead of destroyed say state media and food safety experts. The Chinese government ordered tens of thousands of milk products tainted with the deadly industrial chemical to be burned or buried. It appears that those orders were not completely carried out. "It is crucial to account for the amount that was contaminated back in 2008 and make sure it is being destroyed or disposed of safely," said Dr. Peter Ben Embarek, a World Health Organization senior scientist on food safety based in Beijing. "As long as part of it is still not accounted for, or destroyed properly, we will unfortunately see these types of things happening again." In 2007, Chinese-made pet food sold in United States sickened thousands of dogs and cats, killing some of them, leading to the biggest pet food recall ever, reported the New York Times. In 2008, the U.S. Food and Drug Administration "expanded its checks" for melamine-contaminated food products from Chinato include candy and other items, a spokeswoman told Reuters. "The FDA has expanded its Asian market sampling and import surveillance assignments to include additional products such as dairy-based candies, dairy-based desserts and other such products reported to the agency as having been tested in other countries and found positive for melamine or its analogs," FDA spokeswoman Stephanie Kwisnek told the wire service. "We are testing and we continue to test the products. So far, the FDA has not found any positive samples in the products it has tested."